Own a Chromebook? Here is a version of Malwarebytes that has been engineered to work on your Chromebook. In order to get this, your Chromebook must be able to run Android apps so that you can download and install from the Google Play Store. Malwarebytes for Chromebook is an Android app engineered specifically to protect your Chromebook. Google Play automatically detect your Chromebook and will install the appropriate Malwarebytes product. I am currently running this (and testing) on my Chromebook… I am a firm supporter of Malwarebytes on all platforms (Windows, Android, etc…). Malwarebytes for Android or Malwarebytes for Chromebook free download comes for a limited time with an extended 90-day trial of the Premium version, if you sign up for a free Malwarebytes account. No commitment to buy required. When the 90-day trial is ended, Malwarebytes will only detect and clean, but not prevent, infections. It’s ad-free, forever. What is that old saying, “there is strength in numbers?”… Malware is the leading cause to computer problems today that is also criminal in nature. What I have discovered over the years that no single anti-malware or anti-virus program can give you protection 100 percent of the time. This is where the cloud sourced program called herdProtect can help, as your second line of defense against malware, by providing strength in numbers. 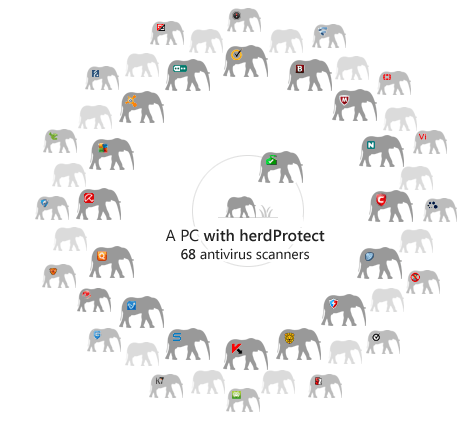 herdProtect utilizes a ‘herd’ of multiple online anti-malware engines (68 engines to be exact) to guarantee the widest coverage and the earliest possible detection. As a second line of defense anti-malware solution, herdProtect is designed to run with any existing anti-virus program already installed on a user’s PC. herdProtect is a free service to help user’s find and remove malicious software; and, is an excellent resource to run, after an infection, when you think you have a computer cleaned of malware using your own anti-malware software. herdProtect is available as a full windows install or can be downloaded and run as a portable app. The herdProtect scanning engine works by monitoring the active objects (processes, modules, drivers, etc.) on a user’s PC as well as the hundreds of auto-start execution points (ASEPs). As new objects such as processes become active in the system, herdProtect will use a secured network tunnel to scan the object for malware against the engines of the top 68 anti-malware scanners. By scanning in the cloud all processor intensive activities are performed independent of the user’s PC. Depending on the aggregate results of the scan, the user can then take the appropriate actions and keep their PC free from any known malware threats. To add another tool to your arsenal in the fight against malware, be sure to visit BitDefender’s QuickScan. BitDefender’s QuickScan is an online tool which uses a technology they call .in-the-cloud. scanning technology which is capable of detecting active malware in less than a minute. The benefit of this technology is that the scanner uses online scanning engines that only uses a fraction of system resources needed to perform the scan; PLUS,the entire database of signature updates, etc… is maintained online by BitDefender. A comprehensive, state-of-the-art protection against malicious threats such as viruses, Trojans, spyware, and other malware. There are numerous security software offerings out there these days to the point, as an end-user, you do not know what direction to go. Typically it is a good idea to layer the protection on your PC. For example on my PC I have installed Microsoft Security Essentials, Immunet and the commercial version of Malwarebytes Anti-malware. All three play very well together and all three are monitoring my system in real-time. Another strategy that I will use, in addition to what is already installed, is through the use of portable security apps. On a periodic basis I run the portable security app to scan my computer. It is sort of my way of getting second opinion. One of the “portable versions” of a security app that I use is Spybot Search & Destroy [ CLICK HERE ] . If you are someone that is an old dog in the world of computers, I am sure you know about the full install of Spybot Search and Destroy; it has been around for a long time. I think I may have swayed from the full install of Spybot at one point due to all of the other offerings that came about, so I am happy seeing this as a portable app option. So if you are looking for a “portable” security app that you can slap on your flash drive as an addition to your tech toolbox OR you are looking for that “second opinion” security app to periodically scan your PC, then Spybot Search & Destroy Portable is a nice addition. Malware infections on today’s PC is probably one of the most frustrating experiences out there. Your PC, when attacked, is rendered useless and attempts to remove the infection is futile. The infection is usually in the form of FAKE security software that has one goal of extracting (stealing) money from you by using the FAKE security software as the bait (and as an illusion). Your attempts to install legitimate security software to resolve the problem fail; your attempts to download malware fixes (from reputable security sites) fail; popup windows accumulate; your security software on your PC is crippled; control panel is crippled; safe mode is crippled; file data on your PC is compromised; and the list goes on and on. In essence, you have lost all control of your PC. Many users end up resorting to a complete recovery of their PC that takes the PC back to factory specs; AND, as a result end up losing valuable file data (such a pictures, emails, important documents, etc…). This experience is not only frustrating to the everyday computer user; but, is also frustrating experience for a computer tech, as well. The attack vector and complexity of these infections changes daily and you have to be prepared. This is where the SUPERAntiSpyware Portable Scanner can help. The SUPERAntiSpyware Portable Scanner is a new product made by the makers of the FREE SUPERAntiSpyware software you install on your PC. I am a real advocate of this software and highly recommend it. Simply download it and keep a copy of it on your flashdrive. When a malware infection attack occurs that renders your system useless, run this scanner from your flashdrive. The SUPERAntiSpyware Portable Scanner is another valuable tool to keep in your Tech Toolbox (on your flashdrive). In addition to keeping the SUPERAntiSpyware Portable Scanner on your flash drive; I also suggest you take a look and install the FREE version of SuperAntiSpyware on your PC. SuperAntiSpyware comes to us in (2)-two flavors. The FREE version and the PAID Professional version. The only difference between the two is that the FREE version requires manual intervention (e.g. scans, updates); whereas the PAID version provides real-time protection, scheduled scanning and other additional protective features. Folks, this is good software and having it installed on your PC adds another layer of protection that plays well with your other anti-virus and anti-malware software products. I have featured this product on the blog several times [ Link ] and highly recommend it. I applaud the makers of SUPERAntiSpyware for making the internet a safer place! Bill Mullin’s Weblog – Tech Thoughts does it again by bringing to us important information about the NEW (and FREE) online version of SuperAntiSpyware. I found this to be important enough that I was compelled to shout about it here on the blog. First, you need to visit Bill’s Weblog – Tech Thoughts to get the fine details on this NEW cloud driven app. Second, you really need to try SuperAntiSpyware Online Safe Scan. It is very easy to download and run a scan on your PC. The definition updates are automatically updated daily so you do not need to do anything other than download and run. The scanner does NOT install anything on your Start Menu or Program Files and does NOT need to be uninstalled. This is another excellent layer of protection to compliment the security software that you should have already installed on your PC. Make SuperAntiSpyware Online Safe Scan part of your normal maintenance routine. Thanks to Bill Mullins’ Weblog – Tech Thoughts for bringing this important security application to our attention! If you are new to the Web of Trust (WOT)… In summary WOT will help you stay safe when surfing the Internet. It is an installation (browser add-on) that will make your internet browsing experience a safe experience. I was just telling someone today, that one of the best protections out there for internet users is the “Web of Trust” (WOT). If you use Firefox or Internet Explorer as your internet browser, you definitely need to install the Web of Trust (WOT) addon. The installation is very easy and it is FREE. I have written about this application in the past and will continue to be an advocate of this product. Web of Trust (WOT) warns you before you interact with a risky website. It helps you stop the bad guy at the front door; not after the bad guy is already in your PC and your security software is going bonkers. Folks, if you do not have this addon installed, then you are playing Russian routlette with your mouse. The more people we can get onboard with this type of protection, the safer the internet will become. Stop the bad guys before they get in the front door. Please visit the “Web of Trust” web site [ CLICK HERE ] to learn more and to install this FREE browser addon that you will not regret. When surfing the internet and interacting with websites that you may be unfamiliar with, you are at a risk of becoming a victim of theft, fraud, spyware, spam, viruses, etc. You are really at the mercy of a mouse click. One click and gotcha… We see text on the screen and take it as gospel and really do not know what lies behind that text. It is our nature to believe the written word and for some reason when we hear the word “internet” we look at it as a protective or secure technology; and as a higher trusting authority. It is everything but that. The internet crime rate has went from that of Mayberry (Andy Griffith and Barney), where one bullet was sufficient; TO, CSI (Crime Scene Investigators) where you get hit (are victimized) and then you are trying to figure out what happened, how it happened and who did it. The internet environment, as we know it today, is an environment of victimization and defense. The fixes (defenses) occur usually after a person or entity has been victimized. The defenses or layers of protection we put into place are our anti-virus, anti-spyware, ant-malware software; firewalls; software updates, etc… These defense measures, if updated properly, take over and attempt to detect or block the threat. The problem with this is that the “threat” has to actually hit home (on our PC’s), before it is detected. If you are someone who surf’s the internet on a regular basis; how would you like a layer of protection, that is easily managed within the confines of your browser (i.e. Internet Explorer, Firefox), that will allow you to visually see what web sites are rated safe or unsafe, before the threat hits home? This layer of protection, that I am a strong advocate of is, the layer of protection that is provided by Web of Trust (WOT). WOT’s color-coded icons show you ratings for 21 million websites – green to go, yellow for caution and red to stop – helping you avoid the dangerous sites. WOT is “FREE”, very easy to install (as an Internet Explorer and Firefox plugin) and most importantly, very easy to use. Web of Trust (WOT) is a community driven service where users (like you and me) are the binding force behind each of the web site ratings. At the time of this writing, WOT had collected ratings for over 21 million web sites. Check out the WOT demo video below and find out how WOT will help you stay safe when surfing the Internet. I periodically visit the Wilder’s Security Forum to see what other people are saying about the various security software products that are available. Forums are managed discussion sites where interest groups of people are formed to openly discuss a specific topic. When I preview software, I always look to see if there is a forum on the site. Forums are excellent information resources and can give you a good overview on the credibility of a matter or subject. Recently while visiting the Wilder’s Security Forum, I was reviewing a topic titled “Probably the best Security List in the World : )”… The title caught my attention and as a result I came away with, what I feel, are (2)-two credible lists of “FREE” Security Software that I would like to share. The first list is maintained at another forum located at a Finnish Antivirus Portal (called Virustorjunta.net). The category titles are in Finnish; however, the sub-titles of the software are in English. You can preview this list by clicking on the logo below. The second list is located at another forum called Respawned. This forum appears to be maintained in the United Kingdom and it appears that the forum topic “Freeware Privacy, Security and Recovery Software” has been updated on regular basis since April ‘04. You can preview this list by clinking on the logo below. Both of these lists provide an excellent overview of the various “FREE” products that are available AND provide a great opportunity to explore and research security software in a “side-by-side” manner. The people who contributed to compiling this information has done a great service to those who are unfamiliar with security software products. The forums which they have made these postings is an excellent way to get feedback, criticism and praise. Knowing what to trust OR what not to trust when searching for and visiting web sites can be a very difficult task. The risks are innumerable (i.e. adware, browser exploits, fraud, malware, phlishing, spam, spyware, etc. ); but there is a solution that will help keep you safe online and it is called “WOT“. WOT is an acronym for “Web of Trust“. WOT is a FREE downloadable browser add-on for Internet Explorer and Firefox that will warn you when you are about to interact with a risky web site. It helps you make an educated decision about a web site’s reputation and whether you should interact with the site or not. WOT is based on a rating system where the ratings are a compilation of reviews, from trusted sources and from everyday users like us, to assess the reputation of web sites. WOT uses four categories which it bases the ratings: Trustworthiness, Vendor Reliability, Privacy and Child Safety. At the time of this posting, WOT had accumulated ratings for over 20.6 million web sites. You can freely download “WOT without registering; however by registering with WOT, you are given access to advanced features of the system, such as customizing protection levels and blocking access to dangerous web sites. Before explaining to you how WOT works, it is important to stress that WOT is only one layer of protection and should also be used to complement other security practices and layers (i.e. firewall turned “on; anti-virus, anti-spyware, and anti-malware applications are installed and routinely updated; Windows updates are maintained; moral browsing habits, etc.). My personal opinion of WOT: “surfing without it is like playing Russian Roulette in your web browser”. I deliberately performed a search for “wallpaper” using the Google search engine. To educate my readers, “screensaver” and “wallpaper” sites are notorious for rogue downloads that can contain spyware, trojan viruses and malware. Reflected below you can see a sample of the search results. Next to the results you will see the color coded ratings and you will notice that I deliberately placed my mouse pointer over one of the “red” symbols at which a dialogue box appeared giving me a good idea that the site I was about to visit was in the “red” in all categories. Should you visit a potentially risky web site, WOT will cause the browser window to darken and a warning will appear. It is at this point is where you make the educated decision to proceed to the site, whitelist the site or acquire additional details.